In order to start using this tool, you have to add your domain and address to Post Office. Attention. In order for statistics to be collected properly, you must configure your domain's SPF-record and DKIM digital signature for all messages in your mailings. Enter your domain or address on the Yandex.Post Office page. Confirm that you own the domain or address through the means offered. After this, you will see a list of your domains and addresses with brief statistics for each one. 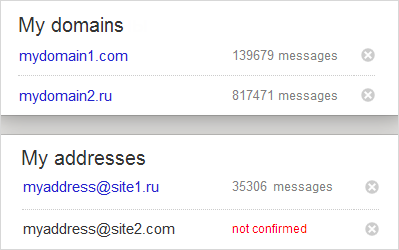 Unconfirmed domains and addresses will be marked with the warning not confirmed.